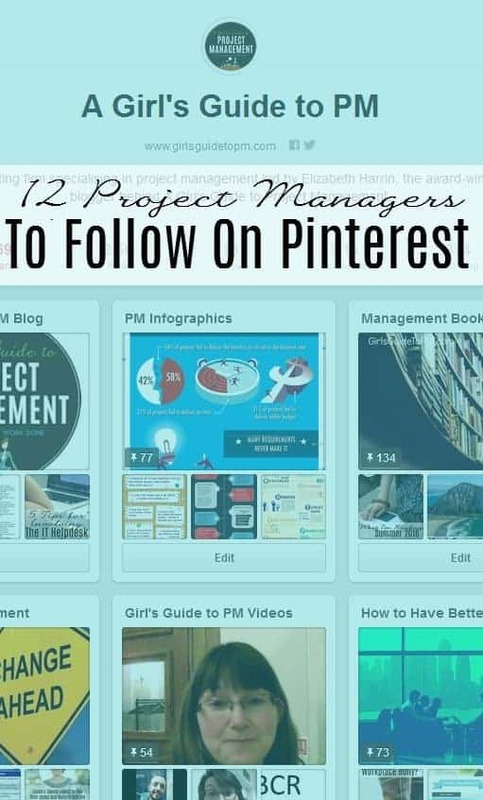 There are a lot of people sharing project management articles, images and advice on Pinterest. Yes, really. It’s not just recipes and crafts, although I do use it for that too. I’ve curated this list of 12 project management pinners and boards so that you can check them out. I’ve tried to make sure that all these users and boards have over 100 pins (often a lot more) and a good number of followers. There are plenty of small project management boards too, so if you do use Pinterest it is worth browsing around or following ‘Project Management’ as a topic. Julia Padget, the woman behind Easyprojecthub, has an active Pinterest account in the name of her company. Her boards are well-organised, colour co-ordinated and relevant and there is a lot of them. She covers everything from virtual meetings to Six Sigma and all the PM topics in between. PM Exam Tips is the account of avid podcast and all-round PM expert Cornelius Fichtner. With over 1000 pins, he focuses mainly on sharing PMP® exam prep advice. Strategy Sarah pins about project management, career planning, productivity and taking action. I got a bit lost going through her boards because there is a lot of good stuff in there. That’s the big trouble with Pinterest; it’s so easy to fall down a rabbit hole and then suddenly it’s lunch time and that project hasn’t moved itself on any. Mike Clayton’s main Pinterest boards are focused around themes that relate to his online project management training. The Project Basics board is one worth checking out. The Project Management Daily board from the guys behind Wrike project management software is a good one. They curate the best articles from their blog. Capterra have a lot of boards that aren’t totally relevant to project managers, but there is a good board on project management software. This Pinterest account is pushing nearly 1.5k pins at the time of writing, but I only came across it recently. There are lots and lots of project management software images and review information, with a board per tool. The LiquidPlanner pinners use Pinterest to save their blog articles and tips. There is also a board called Funny Fridays, which is worth checking out when you need cheering up. They have a small project management board which is full of tips and infographics. It is well-put together and they pin quite a lot, so hopefully this one will grow into a larger useful resource. One to watch. The American Management Association Bookstore Pinterest boards share a lot of content about books, so if you are looking for some inspirational reading then this is a great place to start. Bonita pins a lot of things about travel and smallholdings but she has an active and relatively large (at 370+ pins) board about project management. There’s a focus on tools but some other useful and interesting pins in there too. Follow Elizabeth Harrin on Pinterest. The vast majority of my blog articles are on my blog Pinterest board, and I have a selection of other boards too, from PM templates and printables to PM infographics. I also have some group boards, where other pinners share their best articles too, and I’m happy to add other people to those. If you’re on Pinterest and want to share your project management content, drop me a line and we’ll get you added to my group boards. You don’t have to be a pinner to get value out of using Pinterest as a search engine, so if you are looking for PM advice, tips, interesting articles and inspiration, then browse. You are certainly going to find something useful amongst the toddler crafts and recipes. Awesome tip! I had a PM board, but not nearly all these images and tips. Thanks Elizabeth, I really appreciate the mention of Easyprojecthub. We’re here to help as many people with project management as possible. Good to hear about the other project management boards out there too. Nice content. I am on Pinterest – pinterest.com/jerryihejirika – and I have a project management board too – pinterest.com/jerryihejirika/project-management-resources-and-tips. I currently curate what comes my way, but in the autumn, I plan to start a new Board under my new Online PM Courses brand, where I shall go looking for great content. You can be sure there will be plenty of PM4Girls content on there!